Thank you for using this service, which is owned by Fish Window Cleaning Services, Inc. (“Fish Window Cleaning,” “we,” “us,” or “our”). Some of the information we collect through this Site may be “personal information” - information that identifies you personally, alone or in combination with other information available to us. Other information may be nonpersonally identifiable, such as information collected by cookies. Please take a few minutes to review this Policy before using this Site. By using this Site, you are consenting to the collection, use and disclosure of your information as set forth in this Policy. If you do not agree to be bound by this Policy, you may not access or use this Site. Information You Manually Provide. Fish Window Cleaning collects the information you manually provide (using your keyboard, mouse, or touchpad) when you use this Site. For example, we collect the information you provide when you request a free estimate, provide us with feedback, ask us a question, or otherwise interact with this Site. Some of the information you manually provide may be personal information, such as your name and contact information. Information From Third-Party Social Media Platforms. You may be able to register with, log on to, or enhance your profile on this Site by choosing to automatically populate the requested data fields with information you previously provided to a third-party social media platform (such as Facebook or Twitter). By doing this, you are asking the third-party platform to send us information, including personal information, from your profile on that platform. Information from your browser or device. Fish Window Cleaning collects information that is sent to us automatically by your web browser or mobile device. This information typically includes your IP address, the name of your operating system, the name and version of your browser, the date and time of your visit, and the pages you visit. The information we receive may depend on your browser or device settings. The information we receive from your web browser and device may or may not be personally identifiable. However, we may combine it with other information in an attempt to identify you or we may combine it with information that does identify you. - improve our marketing efforts, including through use of targeted advertising. The information we collect using cookies and similar technologies may or may not be personally identifiable, but we may link it to personal information that you provide. If you do not wish to receive cookies, you may set your browser to reject cookies or to alert you when a cookie is placed on your computer. Although you are not required to accept cookies when you visit this Site, you may be unable to use all of the functionality of this Site if your browser rejects our cookies. In addition to the cookies Fish Window Cleaning delivers to your computer or mobile device through this Site, certain third parties may deliver cookies to you for a variety of reasons. For example, we may use Google Analytics, a web analytics tool that helps us understand how visitors engage with our Sites. To learn more about Google Analytics, click here. Other third parties may deliver cookies to your computer or mobile device for the purpose of tracking your online behaviors over time and across nonaffiliated websites and/or delivering targeted advertisements either on this Site or on other websites. You have choices about the collection of information by third parties on our Sites. For example, if you don’t want information about your visit to this Site sent to Google Analytics, you may download an Opt-out Browser Add-on by clicking here. Please note that the Add-on does not prevent information from being sent to Fish Window Cleaning. In addition, if you would like to opt out of having participating entities collect your online behavior for advertising purposes when you are browsing our websites, click here for a “Website Opt Out.” You will be directed to an industry-developed website that allows you to choose whether each listed entity may collect and use data for interest-based advertising purposes. It may be that some of the third parties that collect interest-based information on this Site do not participate in the Website Opt Out, in which case the best way to avoid third-party tracking of your online behaviors may be through your browser settings and deletion of cookies. The Website Opt Out described above works only on websites. To opt out of having participating entities track your behaviors for advertising purposes when you are using a mobile app, download and use the Digital Advertising Alliance’s “App Choices” app. As with the Website Opt Out, the “Mobile App Opt Out” prevents tracking only by participating entities. Please note that the Website Opt Out and Mobile App Opt Out are device specific and the Website Opt Out is browser specific. If you wish to opt-out from having interest-based information collected by participating entities across all devices and browsers, you need take the steps outlined above from each device and browser. - for any other purpose identified in an applicable privacy notice, click-through agreement or other agreement between you and us. If you have created a profile on this Site, you may be able to access, update or correct your information through your account settings. Otherwise, you may need our help. Please contact us using the information provided below. We will respond to you within a reasonable time and, in any case, within the time limits established by applicable law. We may ask you for additional information to verify your identity. In most cases, we will provide access and correct or delete any inaccurate information you discover. In some cases, however, we may limit or deny your request if the law permits or requires us to do so or if we are unable to verify your identity. If you seek deletion of information that you provided when you were a minor, please contact us using the information provided below. We maintain reasonable administrative, physical and technological measures to protect the confidentiality and security of personal information you submit on or through this Site. Unfortunately, no website, server or database is completely secure or “hacker proof.” We therefore cannot guarantee that your personal information will not be disclosed, misused or lost by accident or by the unauthorized acts of others. Further, we cannot control dissemination of personal information you post on or through this Site using any social networking tools we may provide, and you should have no expectation of privacy in such information. With Third–Party Vendors. 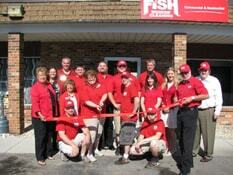 Fish Window Cleaning shares information collected through this Site with third-party vendors who act on our behalf. For example, we may use third-party vendors to design and operate this Site; to conduct surveys; and to help us with our employee recruiting and promotional efforts. These third-party vendors may need information about you to perform their obligations. Typically, they are required by contract to keep your information confidential and to use it only to provide services on our behalf; however, as described below, we may allow them to use aggregate or de-identified data for their own purposes or to market the products and services of their other clients. With our Franchisees and their Employees. Fish Window Cleaning may share information collected through this Site with the owner of any one of our locations that you have used or in which you have expressed interest. These franchisees are permitted to share your information with their employees for the purposes of operating their business and to use your information for their own marketing purposes and in a manner otherwise consistent with this Policy. With Third-Party Social Media Platforms. We may provide functionality on this Site that allows you to automatically post information to a third-party social media platform (such as Facebook, Twitter, or Pinterest). If you choose to take advantage of this functionality, people with access to your profile on the third-party platform will be able to see your post. Thus, you should have no expectation of privacy in those actions. Further, if you choose to link your profile on this Site with an account on a third-party social media platform, we may share the information in your profile with that third-party platform. We may also use third-party social media platforms to offer you interest-based ads. To offer such ads, we may convert your email address into a unique value which can be matched by our partner company with a user on their platform. Although we do not provide any personal information to these platform vendors, they may gain insights about individuals who respond to the ads we serve. We are proud of this Site and we strive to ensure that it doesn’t offend people of any age. However, this Site is not intended for children or minors under the age of thirteen years without the permission of a parent or guardian. If you believe that a child has submitted personal information on or through this Site without the consent and supervision of a parent or guardian, please contact us using the information provided below so that we can take appropriate action. Fish Window Cleaning Services, Inc.